A few articles have been written recently about the sale of Good Technology, a mobile security startup, to BlackBerry for about $425 million, after having attained Unicorn status through a previous round of private financing. Good had a layer of preferred stockholders – presumably all of them are financial investors – who had first dibs on the sale proceeds, leaving the common stockholders – which is what employees were – with the scraps. Good’s board is now facing a lawsuit from its common stockholders citing breach of fiduciary duty (most of the board were de facto representatives of financial investors – which is common, but does lead to a perceived conflict because directors are meant to be looking out for the company and not their funds, especially as the interests of the two may sometimes diverge). Employees are also complaining that executives painted a much more rosy picture of the company’s health than it really was, essentially misleading them as to the value of their stock. From a corporate law perspective, that is all very interesting stuff to me, but that’s not what I’m writing about. Good filed to go public in 2014 so its financial statements were public. I am far from being a finance or accounting expert, but if I was going to buy more of my own company’s stock and further concentrate my position in it, I would take a very good look at its financials. 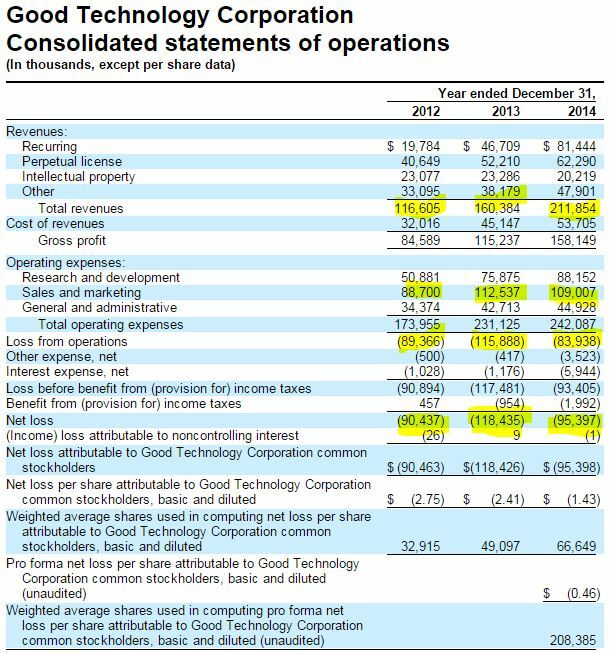 I took a cursory look at Good’s 2014 financials. The following analysis is based on my shaky and questionable understanding of financial statements. As with a lot of unicorns, Good showed strong revenue growth, rising from 117m to 212m from 2012 to 2014. However, revenues are only part of the picture. Good was not profitable. It was actually making large operating losses at 89m, 116m and 84m from 2012-2014. Earnings (or rather, losses) after interest, tax and depreciation were roughly the same. Large losses, by themselves, are not necessarily bad, as long as there is a good reason for them. If the losses are caused by investment and R&D activity, that can be positive, as long as you see positive results from the investment. If the losses are occurring because the things the company are selling are inherently unprofitable (and that includes all the support infrastructure that goes into selling and supporting things), then that’s bad. Good’s sales and marketing expenses were high, but they had actually pared down on that expense in 2014 while increasing revenues (a good sign), and reducing its losses. So if that trend were to continue, Good would eventually get to profitability. 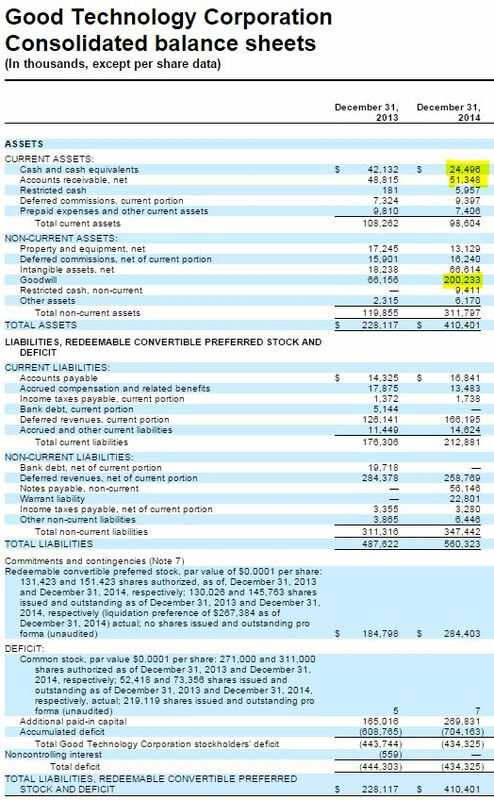 But an 84m loss is a lot of money to be burning through to get to profitability, and so we look at its balance sheet. And that’s where I see a problem – going into 2015, they only had 25m in cash available, plus another 50m or so that its customers owed it. That’s not a very long runway, when in the previous year they were burning through about 7-8m a month. Sure enough, they were struggling in 2015, and by the time BlackBerry was circling, they had apparently exhausted their short term assets and needed bridge financing of $40m to tide them over during acquisition talks. At an all-hands company meeting in June, Ms. Wyatt again said Good was spending responsibly. Thanks to the cash from a recent $26 million legal settlement, she added, the company had “a ton of options,” including an I.P.O., according to a video of the gathering. “We were under the impression that Good was doing well, that there was nothing wrong with cash flow and that we had a lot of options,” said Igor Makarenko, Good’s chief information security officer, who has been an employee since 1997. If I was told that, and I was looking at the financials, I would have been nervous and asking some very specific questions. In a part of the world where equity can make up a large percentage of employee compensation, I sometimes find it jarring how little an understanding there is among employees of how it works. Silicon Valley startups give equity to employees to incentivize performance and make them feel like owners – as the company’s fortunes rise and fall, so too do yours. But it’s also a financial investment, and you have to act like a financial investor if you really want to understand it.